The organ is positioned on the north wall of the chancel. An organ was installed in June 1891 by C Lloyd and Company of Brighton Street, St Ann’s, Nottingham, at a cost of £120. 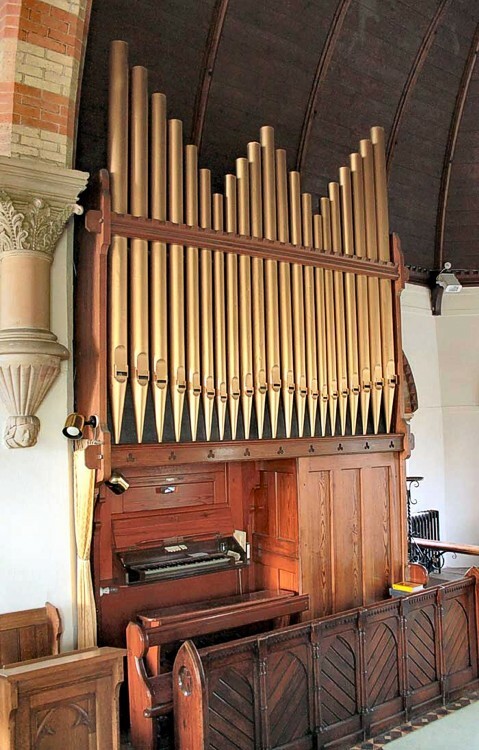 The original specification describes it as a pedal organ with 56 notes. It further records detailed specification of the instrument: the 21 metal pipes were to be fabricated using a mixture of Chinese lead and tin. The organ still has 21 metal pipes. The wooden pipes were to be of St. John pine and mahogany, with the smaller pipes guaranteed to have been made for at least three years, with a case specifically of pitch pine, and the pedals of American birch. Over the single console is a hinged folding cover which house the ebony and ivory draw stops, and the 56 keys. This information was recorded in a letter dated 3rd June 1891, held in Nottinghamshire Archives. This organ was removed and replaced by the current organ in the late 1960’s or early 1970’s by Henry Groves and Son. It is believed to have come from a chapel, at either Nottingham Prison or the City Hospital, that was being demolished or refurbished. The central section of visible organpipes are dummies which can be removed to allow access for servicing and repairs.